Wanting to buy a Sedona Home? Red Rock Realty is your full-service Sedona Brokerage. Sedona is one of the hottest vacation destinations in the world and with that vacation rental homes have become more and more in demand. They offer visitors alternative accommodations, more privacy, space and savings over hotels and resorts. 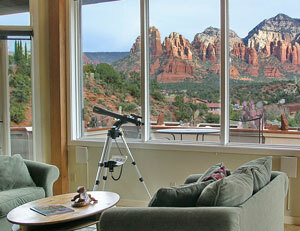 Visitors enjoy family and friends in a home to return to after their days out experiencing Sedona and Northern Arizona. Red Rock Realty is a pioneer in the Sedona vacation rental concept, providing management, maintenance and marketing of privately owned homes in the Sedona area for over 30 years. This method of ownership supplies home owners with income on their Sedona vacation property, providing them the opportunity to visit Sedona whenever they desire, while revenue from rentals offset their expenses. Our many years of experience in the Sedona vacation rental market makes us experts on what rents and why, we know how to make your home more appealing to visitors and thus more valuable to you. We will assist you with locating the best qualified property for the Sedona rental market. If you already own, we will guide you in the how to's of creating the vacation home renters return to again and again. Red Rock Realty's property management program is unique, offering both professional management and maintenance services combined with in-house marketing and graphics. Our web presence is a key element to presenting your home to the international community, providing attractive visuals and full information about your home which includes a complete photographic portfolio of its special features and amenities. Your home will be staged and photographed to look its best, inviting travelers to come and visit! Your property will then be marketed to the world through social media and national and international vacation rental sites. Red Rock Realty handles all reservations and collection of all incomes. Owners are provided access to their reservations calendar, where they can enter dates for future visits and review reservations. Renters are carefully screened before reservations are made to assure complete security of your investment property. Red Rock Realty reports to you monthly, this includes reporting all rental income and monthly expenditures. We employ an independent team of exceptional housekeepers who keep each property well maintained and equipped for each new renter. Each home is inspected randomly to insure quality control of housekeeping crews. Your home is routinely inspected and maintained. Red Rock Realty is authorized for emergency repairs up to $500.00. Repairs over $500.00 must be authorized by you, the owner, except in emergencies to prevent further damage to your property. If your desire is to own a home in Sedona, retire here some day, but in the mean time visit as often as you'd like, the vacation rental is perfect for you! If you already own and desire to generate rents from your Sedona investment, we can make that happen! We are happy to answer any questions and provide you with the necessary tools to make your Sedona vacation property an income generator. Let us help you create your Sedona reality! Contact Red Rock Realty to learn how to make your home a Sedona destination! Wanting to buy a Sedona Home? Red Rock Realty is your full-service Sedona Realtor.